RE•WORK | Blog - World Health Day: Is Medical Imaging Transforming Healthcare? World Health Day: Is Medical Imaging Transforming Healthcare? With the rapid advances in AI, there is huge potential for healthcare to be positively transformed and to help overcome the challenges of doctor shortage and financial limitations. In developing countries, one of the largest bottlenecks in providing adequate care lies in the shortage of doctors. Two doctors from Nigeria ‘their African country of 190 million people has a major shortage of doctors. They are among a group of fewer than 60 radiologists that serve the entire country’s population.’ It is evident that a solution is needed, and training more human doctors is inefficient - it’s time consuming, costly, and unreliable. In the western world, one of the most important components of modern healthcare is diagnostic medical imaging to help diagnose diseases more efficiently and at earlier stages than previously possible. Medical imaging is still time-consuming and labour intensive, but by applying deep learning to the method it becomes quick, accurate and in many cases, life-saving. The technology is expensive and still the subject of much research, but progress is moving quickly in the western world which will then filter to other corners of the globe to transform their healthcare practices. At the Deep Learning in Healthcare Summit in Boston this May 23 - 24, global AI healthcare experts will explore this topic in further detail. Confirmed speakers include Sadid Hasan, Philips Research; James Cai, Roche Innovation Center; Amit Deshwar, Deep Genomics; Wei-Lun Hsu Alterovitz, FDA and many more. 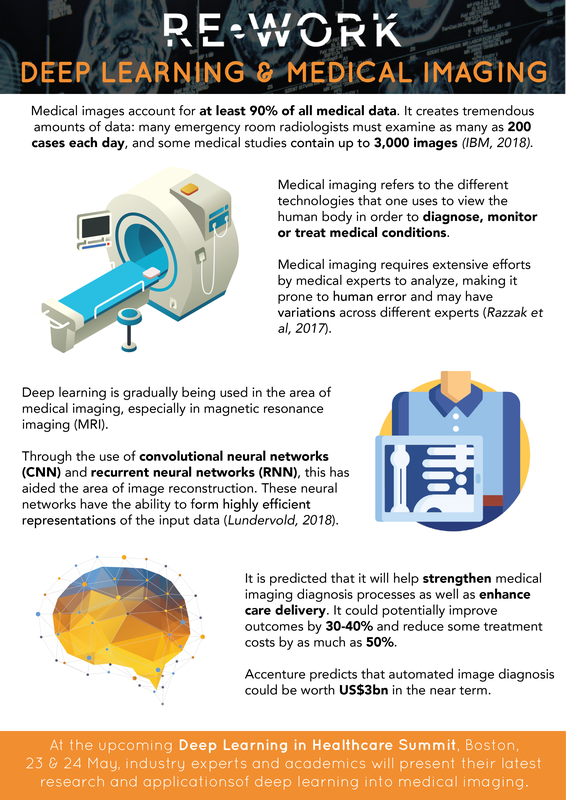 This infographic explains the efficacy of medical imaging and highlights the ways in which it could be a transformative technology.